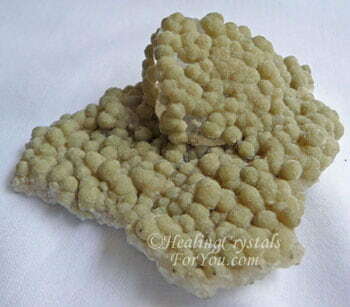 Gyrolite is most well known for its action to aid healing of bone breaks and muscle pain, and it is known to have other beneficial healing properties. 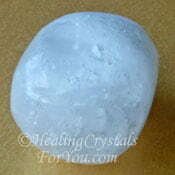 This mineral is effective to use in meditation, as it will stimulate the third eye, crown and sacral chakras. When used at these positions it may help you to learn information about ancient civilizations and you may discover how they used healing crystals in healing layouts. 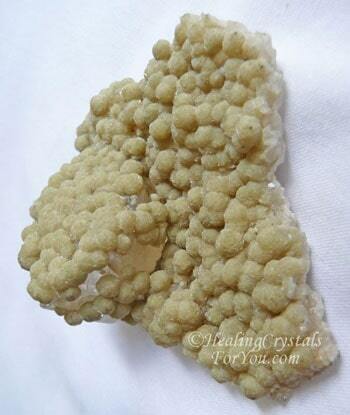 It has some interesting metaphysical properties, including initializing the energy of other minerals it is combined with and helping to boost the flow of qi in the body. It is also said to help you if you wish to take up dancing or do drumming, as it is known to improve your ability to be more rhythmic. 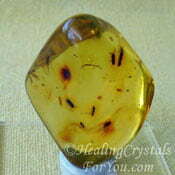 The meaning of the name of this mineral comes from the Greek word Guros meaning 'circle' or 'round'. 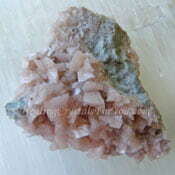 It is also known as Glimmer Zeolite, Centrallasite or Gurolite. 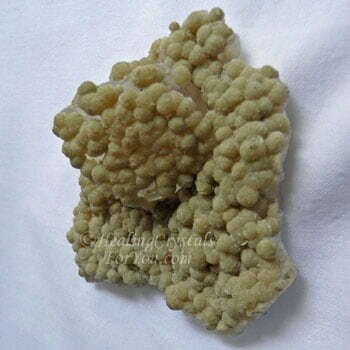 This mineral is often thought of as a member of the Zeolite family but it is not, although it is often found in the same places as Prehnite, Okenite, Apophyllite and other zeolites. These crystals often form in a circular shape as nodular aggregates and as spherical masses on host rock, including on calcite. Most pieces of this stone have a dull appearance, and their color may be white, yellow, light green, colorless, brown or grey. They were first noted on the Island of Skye in Scotland but have since been found in quite a few other places. 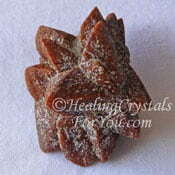 They are found in a few locations in India, including in Pune, an area where many zeolites come from. They are also found in Iceland, the Faroe Islands in Denmark, Greenland, Russia, the Czech Republic, Ireland, Italy, Australia, Japan, China, Canada and a number of places in the USA. Why Would You Use Gyrolite? 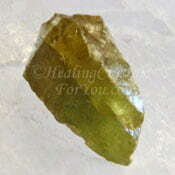 This crystal is said to cleanse and activate other minerals with which it is combined. It is known to assist the fulfillment of perfect health, through its action to disseminate the healing energy known as qi throughout the body. This purported effect may make it a useful stone to aid acupuncturists, via its known action to help the energy to flow better through the nervous system. 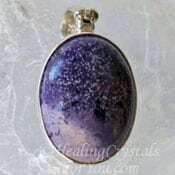 It resonates at the third eye and crown chakra so is an excellent stone to use for meditating with, as it may assist you to connect with spirit beings related to ancient civilizations. It is said to have been used in ancient India, as it was thought to bring greater understanding and sharpness of intellect, and to improve the will-power. 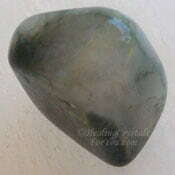 It is purported to have been a stone utilized by Buddha, and was said to aid the flow of enlightened thinking and to boost intellectual prowess. The meaning of stones like these relates a lot to their ability to absorb toxins, and to their overall good general healing action. 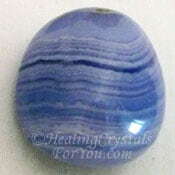 These stones are also helpful to aid emotional healing and are particularly useful used when an emergency occurs and you need support to continue. It may be a helpful stone to use after breaking bones, as it has an excellent action to help problems related to the muscles and the spine. It is said to assist the body to better absorb calcium, very useful when you have broken a bone that needs to heal. 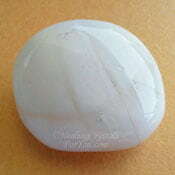 This stone's energy may assist you if you wish to become a better dancer or drummer as it may aid you to become more in tune with the rhythms required. By using it in meditation to make a spiritual connection with drummers from ancient civilizations, you may learn about specific techniques they used. This may assist current drummers with their technique. 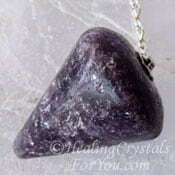 Use it in meditation on the sacral or navel chakra to make a connection with ancient dancers in spirit. It is said to aid you to both absorb the tempo and flow of ancient dancers as well as gaining an understanding their technique and approach to the dance. 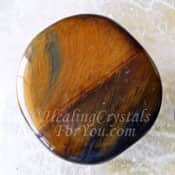 These stones have an interesting energy that aids an improvement in your muscle tone as well as aiding healing of muscle issues and may help with the healing of broken bones. It is known to assist those who do yoga to get the body into the more difficult poses. 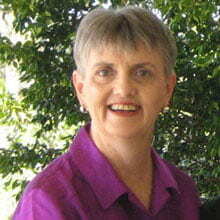 "Health is the greatest gift, contentment the greatest wealth, faithfulness the best relationship." Buddha. 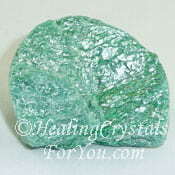 This crystal is known to assist with the healing of broken bones so if you have a broken bone that needs some help, you might like to combine it with other stones for this purpose. 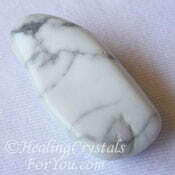 There are a number of other stones that are helpful to aid the healing of the bones, including Howlite, Hackmanite, Tigers Eye, Blue Lace Agate, Glendonite, Malachite, Dolomite or Sphene aka Titanite. If you are suffering with muscle pain and need extra help, you may choose to use this stone in combination with other stones that assist muscle pain. 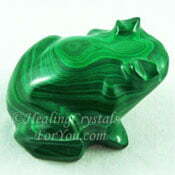 Stones for this purpose includes Emerald, Amber, Lilac Lepidolite or Fuchsite. 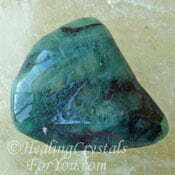 This stone may be beneficial used in meditation with some of the third eye stones to boost its action. 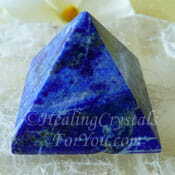 Third eye chakra stones that you might choose includes Lapis Lazuli, Tiffany Stone, White Onyx, Howlite or Selenite.